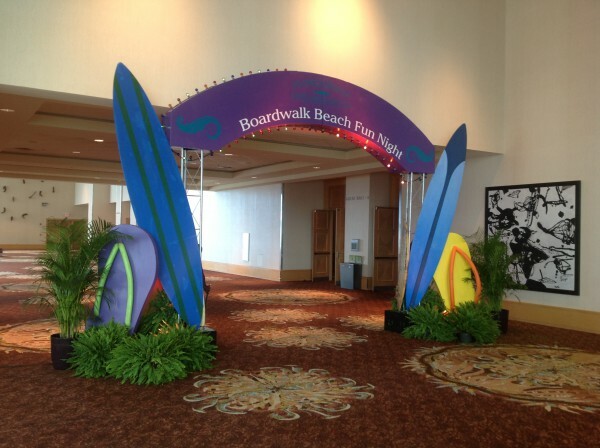 MKE collaborated with the creative minds at Advantage DMS to create a retro “beach boardwalk” experience inside the Westin Diplomat ballroom walls! Bright colors and beachy decor paired perfectly to create a festive atmosphere for the guests! A custom branded arch, supported by sleek techy towers, was specifically outfitted with colorful chase lights to create a glowing greeting at the event entry. 10′ high surfboards were paired with oversized flip flops to bring in the “sand & surf” elements for the beach boardwalk-themed event! Our 13’6″ long 1958 Corvette buffet was a WOW for guests as they entered the space. How did we get a car into the ballroom? 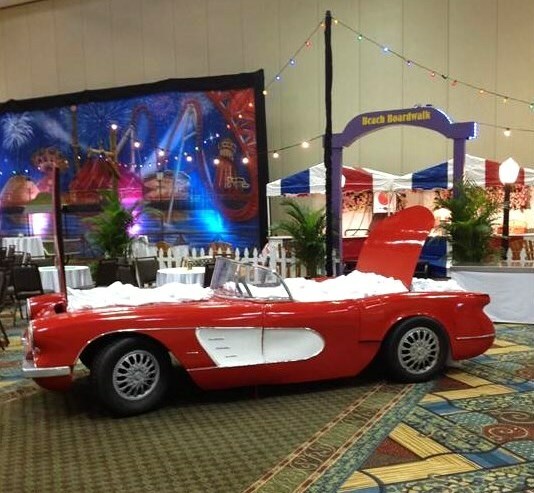 The Corvette replica is created from fiber glass parts that the MKE team meticulously assembles to look like the real thing…with the practical thought of introducing food display space to make it functional for events! The Corvette wasn’t the only food station on wheels at this event! We also assembled one of our tri-bike action stations inspired by the “surfside street vendors” seen in every beach town. 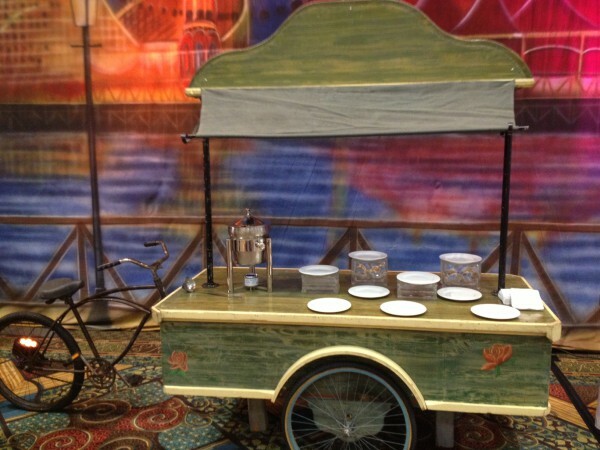 The 8′ long tri-bike provides approximately 6′ of table space for food service. 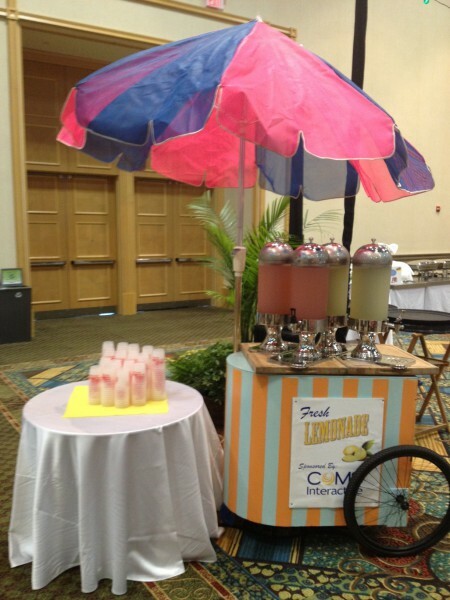 A perfect example of decor being multi-purpose is our whimsical & colorful lemonade cart that served as a beverage service station & to showcase branding ! 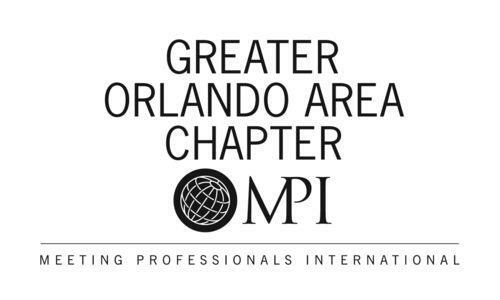 A simple, and fun, way to incorporate sponsors! We may not have been on the beach, but we still had a beach boardwalk! A bright purple arch was centered on the 40′ of “sea-weathered” plank sections to create the “boardwalk” feel. 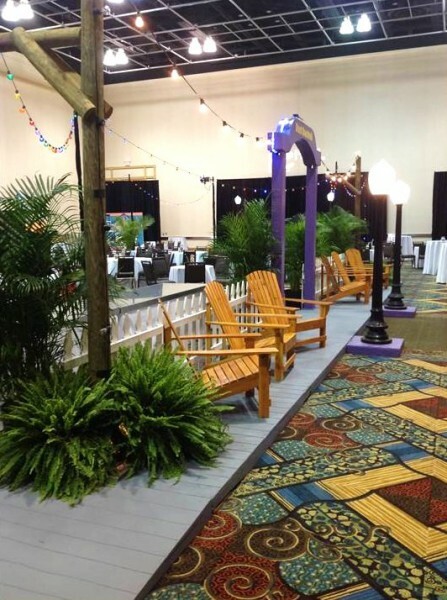 Natural-stained adirondack chairs were inviting seating elements for the guests to relax in, complete with festive string lighting hung overhead to complete the look! We always enjoy the opportunity to collaborate with the amazing individuals at Advantage DMS, especially on such a fun & festive theme!